We have started putting together a list of topics / learning objectives for a new course: “Agile for Managers”. I am interested in getting suggestions from readers on topics to include. 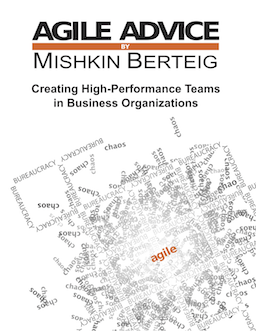 What are the challenges you have had with managing agile teams? If you are on an agile team, what are some of the challenges you have had with management? What are the burning questions you have as a manager about deciding to use agile methods? What have been some of the critical success factors in adopting agile methods? What about pitfalls? I will summarize feedback in a future article as well as post a proposed agenda for such a workshop. In order to “give back”, I will also make the initial draft of the course materials available under a Creative Commons license so that others can use the materials. We have an upcoming three-day agile training seminar in Markham September 7 & 8, 2011. In this unique seminar, we will be offering a practical view of three important Agile methods: OpenAgile – used for general agile project management and agile teamwork including projects and organizations doing any kind of work. Scrum – used for software new product development and IT project management. Kanban – used for teams doing operational work. This seminar contributes towards three certification programs: the Scrum Alliance’s Certified ScrumMaster program, the OpenAgile Team Member level and the IPMA/PMAC Agile Project Management certification. Proudly delivered by Berteig Consulting, a Canadian organization since 2004. We have an upcoming three-day agile training seminar in Toronto, August 22-24, 2011. This 3-day training covers 3 Agile methods: ScrumMaster (the most popular Agile method), OpenAgile (the most widely applicable Agile method), and Kanban (a method that can be used together with other Agile methods). Great opportunity for Eastern Canadians to get introduced to WAYK!!!. Recently, I had an interesting discussion with a companion about Agile Processes and the need for corporations, communities or groups to change their approach to planning and doing work. We were discussing using OpenAgile as a Framework. The person I was talking to told me that their group (Artists) were already used to and embraced the idea of shared responsibility, self-organization, mutual respect and open discussion to get things done. OpenAgile (as well as Scrum) require open communication and truthfulness to be effective tools for self-organization. My friend then told me how it made sense in the Art Community but it would be hard for Financially minded people to believe in what Agile was about and that it would be even harder for financially oriented educators (ie: Universities and Colleges) to change their minds about teaching Agile processes as a primary part of the education system. For many people, they hear FIRST about the need to share work, how the organization changes, how people are treated better and all the usual comments. I realized I need to change my approach with these types of people to first discuss how agile processes work to benefit Business Value and Quality. My 15 second elevator speech should start with these ideas and not the other way around. I don’t know of any business leader, financial manager, non-profit CEO or educator that would think it to be a bad idea if I said to them “Listen, I would like to show you a way to do the most valuable things first, with exceptional quality while at the same time consistently getting better at it. Oh, and as a by-product, you will also have more engaged, long-term staff. What do you say ?”. We must admit that OpenAgile (or any other Agile process) is not a silver bullet to be used everywhere for all groups. I have however found that after teaching about iterative work and the IDEA of Business Value and Return on Investment, even a “non-agile” team can still benefit from some of the procedures or “routines” of a fixed cycle of learning and it’s heartbeat. All of the new ways of doing things including culture shift, team based work, etc. would be unfortunate for a business without first remembering that the purpose is to provide Quality and at the same time provide the items that have the most VALUE to the organization. Quality is an inherited part of the process of going Agile. As more discussion happens and all people in the team have input into the process, inevitably, you should end up with a better result. The customer has more direct input into the final product as it is being created, therefore helping to achieve a result that everyone is happy with. The real goal to business is this Quality, and the way to get there is all these things that Agile asks us to do, through a continual process of learning. Business Value. This means different things to many people. Where you are using OpenAgile, Scrum, XP, Pomodoro, remember, the goal of all of these is to work on the tasks that will provide the company or organization to most Business Benefit First. When coupled with the idea of Return on Investment, the reasons are just far too compelling to an organization to ignore. After all, no organization of any type can afford to exert effort with no return at all in the form of artifacts of some sort. Every organization is there to create some kind of result (value) in its’ chosen field. Most organizations have many different opinions and reasons for considering one item more valuable than another. You will likely find that most people think ALL of their backlogged items are of equal value to a project or company. The idea of doing work based on Return on Investment takes some of the emotion out of this process to allow work that is clearly more beneficial to the group to take precedence. When a task is determined to be of lower value (not because of just value, but work for value) doesn’t make it into this cycle, it MAY well be classified as a higher Value for the next cycle, and therefore, it’s Return of Value / Work may be higher and bring it up the work scale through this process. There are several ways to accomplish this. One of the easiest is by breaking the item to be done into smaller pieces. It’s Value will remain the same, but the work (effort) required to complete that smaller piece will be less. Therefore, the new smaller task will have a higher Return on Investment and be done sooner. The idea is that true business value is what is provided first with many competing priorities. Most of us don’t have the ability to just add two or three more teams when more work comes along, so there needs to be some logical process to deal with this.